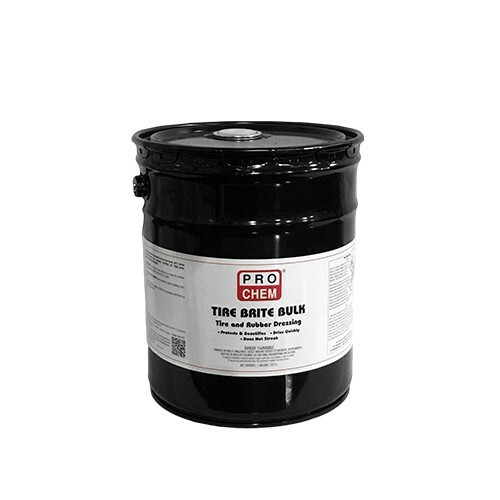 TIRE BRITE BULK | Pro Chem, Inc.
TIRE BRITE BULK is specifically formulated to give that deep, glossy finish that will keep tires looking great for weeks, even through multiple washes. Keeps new tires looking their best and restores older tires to a like-new, deep luster. No wiping, no buffing or mess. Just spray and walk away. It also prevents browning, cracking and premature aging. For use on rubber: Spray directly on clean, dry surface. For best results preclean surfaces thoroughly. For use on other surfaces: Preclean surface thoroughly. Spray on rag and wipe on surface. DO NOT refill this container. DO NOT cut container with torch as explosion may result.